I have to imagine what it’s like to live in a house with one bathtub and eight other people. I have to imagine a home that’s not even 30% of the size of the one I live in with my wife and sons—the one that on certain days we think is cramped. I have to imagine a poverty so real that receiving a few oranges for Christmas is a reason to be overwhelmed with gratitude. I have to imagine that bathtub again and imagine seven other people washing in the same water before I get a chance. I have to imagine all of that, because I never lived it like my parents did. Those stories belonged to one or both of them at some time in their childhoods as they lived—as part of their everyday lives—a kind of poverty I wouldn’t come close to believing until I was well into adulthood. I don’t hold up these stories as a point of pride or to, as some people have suggested about the fortunate and ashamed class to which I belong, “out-poor” anyone who has struggled through real poverty. I only re-imagine those stories I learned over the years to remind myself one thing: that’s where I’m from. My family lived relatively modestly through most of my childhood, a fact that I wouldn’t fully appreciate until much later in my life. There were many times I would lie awake at night and worry that we would lose our house. That fear was probably unfounded, but it was as real for me as the burglars that ripped open our stuffed animals and the Dobermans that chased me down the street. It was a strange evolution from my grandparents’ dust bowl dirt-farming struggles. The picture above is family just two generations before mine, dressed in their absolute best to honor the dead, knowing they are lucky to still be breathing themselves. They didn’t have to worry about having almost nothing, because that’s what they had already. As my parents worked to build and build over the top of their childhoods, I’d occasionally find myself in my dad’s car as he slipped off one of the main roads in our town. He’d hang a right and then another right, and suddenly we’d be in a different world, one of ramshackle houses, tired-eyed people, and dust where grass should be. There was desperation there, people who clung as hard as they could to their pride—the last thing they truly had. Even that pride seemed like it could be repossessed at any moment. I asked my dad once why he would drive us down that street we didn’t have to be on. I wish I could remember his exact words as well as I could remember the lesson. In any case, the sentiment was always clear: not everybody is as lucky as us. And how well do I remember those drives? 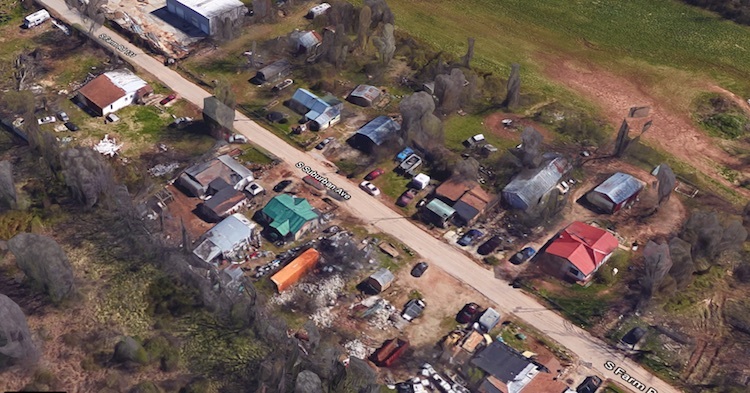 I couldn’t tell you exactly how to get to the houses of girls I dated or to the infamous Snider’s Bridge where everyone went to fight, but I found that one street via Google Maps in a matter of ten seconds without knowing its name. Why? Because it’s part of where I’m from, too. As a nation, we were either aghast, head-shakingly disappointed, or in the case of the true believers, inspired by the man who once again was “telling it like it is.” There is no talking to the last of those, because they’ve already forgotten that their benevolent leader believed no less than 18 months ago that they—those miners from West Virginia, those farmers in Mississippi, those unemployed and opioid addicted in some Tennessee holler—were people from a shithole country, too. Nevertheless, we all once again tried to account for how the man who serves as the jowly face of our nation could so badly represent how the rest of us feel. Are we as a nation meant to believe that people from Africa, El Salvador, and Haiti are less worthy of our good fortune simply because of where they born? Would we, as the suggestion went, be better off using our wealth and resources to help those Nordic-white faces of Norway? Well, as far as the man we elected is concerned, the answer is an unwavering “you betcha.” For anyone who has ever had the education of traveling outside the United States, or better, coming to know and love people who did not grow up in America, the idea that we would discount a person’s worth based on where they are from is unthinkable. For the man engaged in an Oval Office sit-in, however, where a person is from is one of the most important things about them. I’ve been incredibly fortunate to visit some of the places the leader of his free world believes to be shitholes. I’ve seen entire towns of dirt streets in Argentina where dogs trail behind old men with shopping carts full of butcher’s scraps, Brazilian favelas built into the side of a highway, and Ghanaian slums where children are so hungry for food they line up for a juice box and then are so grateful for that love, they offer their juice as thanks. For the chieftain executive and his legions, where a person is from actually has very little to do with a map. If you listen very closely, you’ll hear what they are really saying: the shitholes are places where people don’t already have opportunity, places where people are poor, places where people are not white, and places where people don’t speak English. You may hear him say the names of other countries and continents, but he’s speaking about large swatches of America at the same time. And hey, you may not realize it yet, but there is a damned good chance he’s talking about you. You know why? Because I know he’s talking about me. It’s more than disingenuous to look around at where we are now and assign a moral equivalence to who we are. It’s prideful, and if you believe pride is a sin, then you can do the math. I’ll take pride in any work I’ve put in, but I know I wouldn’t have woken up in a nice suburban cul-de-sac this morning if it hadn’t been for my parents, grandparents, and the people before them who worked their hands bloody. I would never have had the luxury of living in this Greenville, SC suburb if not for the struggles and sacrifices my ancestors made in the Carolinas, Alabama, Tennessee, and Texas. They watched children die, battled addictions, worked jobs that would never make them rich, and kept walking forward. And you know what? They had it easy compared to every family that tried to navigate America as a minority at any point in our history. My people—by and large—were lily white, and that was one hell of a passport. The only way I’ll ever earn that head start is if I remember it and learn from it. The only way I’ll earn that head start is if I refuse to let anyone who lived as my ancestors did—or in many cases worse—be treated as if where they are from defines who they are and what they are worth. The America that makes me a proud American is the America that recognizes we would not be who we are but for the people who came from everywhere else. If we are exceptional in any way it’s that we embrace the idea that being lucky enough to be born in America is neither a moral virtue nor anything that’s been earned. The only way we’ll remain true to this country’s core values and earn the good luck we have is if we refuse to let our despots convince those of feebler minds that geography, wealth, and good fortune are prerequisites for our compassion, security, and opportunity. In 2018 America, I can scan through all of Google maps and see the neighborhoods of El Salvador, the open-air schools in Ghana, the streets of Flint Michigan, and the neighborhood Dad drove me through when I was ten years old. I can see poverty and struggle and know it doesn’t define the people who are living it. The hearts and minds of the people make up a place—not the other way around—and if you need any evidence of that, I can point you to the best example of a shithole available today. Just type 1600 Pennsylvania Avenue into your browser. Google will do the rest. Suggested reading: If this is a topic you’d like to explore a little more in depth, I’d recommend Part 4 of the massive essay Bubbles written by a friend of mine.